Acupuncture is a traditional Chinese treatment option that utilizes long, thin needles to stimulate total body healing and wellness. It can be used to relieve pain and speed healing for many different types of injuries and ailments, including neck and back pain, headaches, Fibromyalgia, and osteoarthritis. 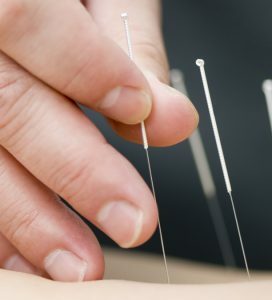 Acupuncture treatments can be used by itself or combined with other pain management services. Corrective exercises are targeted and designed to strengthen injured or weak muscles. When you come into our integrated health office for a corrective exercise session, you will be instructed on how to perform the exercises and taken through a routine. We will also provide you with instruction sheets so that you can exercise at home. By performing the exercises both in our office and at home, you have the best chance of making a speedy recovery and relieving pain. Our integrative medical team understands that you have daily tasks that you must perform while you are healing. However, performing a task wrong could reinjure the area or cause additional injuries. Here at Orland Park Integrated Health, we offer alternative ways to perform your daily tasks that will reduce your risk of reinjury while you are healing and investing in preventative care for your body. Maintaining good posture can help prevent many neck and back injuries, including lower back and upper back pain. Our medical team in Orland Park Integrated Health can evaluate your posture and spine and make recommendations that will improve your posture and reduce your back pain. Regular posture screenings can also help diagnose certain back ailments, like scoliosis, before they become severe. We can also recommend ergonomic changes for your home and work offices. For more information about our medical and chiropractic care services or to schedule an appointment with our integrative medicine doctors at Orland Park Integrated Health, call us today at (708) 403-2746.